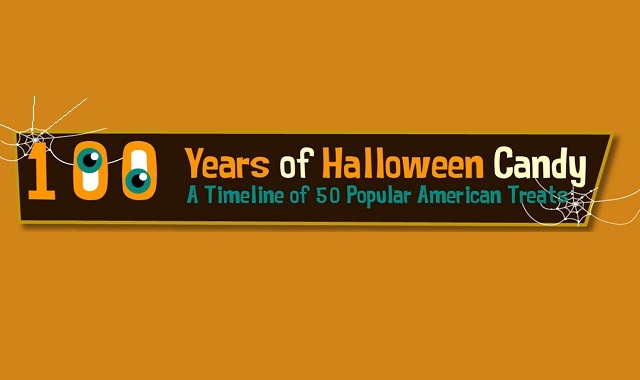 100 Years of Halloween Candy #infographic ~ Visualistan '+g+"
Halloween as we know it today was born in the 1920s and 30s, this is when true trick or treating began. While there have been phases and eras where trick or treating involved receiving money, fruit, baked goods, and other odds and ends, we eventually settled on handing out candy. Candy companies have a long and impressive history and evolution over the past 100 years and this infographic timeline aims to prove it! Did you know that Kit Kat got its start in the 1930s? What about Life Savers; did you know they've been on store shelves since 1912? The history goes far beyond current candies too, there are plenty of candies have have long been discontinued that might surprise you! There is a lot more to learn about Halloween than just the costumes that you wear. It's fun to know that when you get home from a long night of trick or treating that you'll have collected a lot of history right along with the candy!